The 20 Year Trend Cycle: What Is Next? If you live long enough, you will probably see the fashion trends of your youth cycling back into popularity. Analysts are trying to get to the bottom of this mystery, by looking at the recurring trends throughout fashion history. The most cyclical movement in the history of the fashion industry is referred to as the “20-Year Rule.” This rule expresses the concept that something popular now will be popular again in 20 years, give or take a few years. Although new trends are always emerging, they are often modernisations or interpretations of the trends we have already seen. About Style have outlined the process of trend popularity, with fashion designers always on the look out for ‘what’s new’. First, the emerging trend is highly sought after, being found on red carpets and runways, as well as music videos and movies. Next comes the ‘emulation’ phase, where everyone jumps on board, with the trend being found in magazines and on TV. This is where the majority will participate in the trend, where looks and styles are available for purchase in high-end fashion collections. Finally, the trend becomes saturated in the market and is widely available as a knock-off. A change in the fashion industry has stemmed from the digital revolution, with designers producing ready-to-wear collections. Iconic fashion brands, such as Burberry, have waived the idea of seasonal fashion and made their collections available to the public immediately after their showcase. For fashion enthusiasts, this means faster access to the latest trends and an exclusive opportunity to be up-to-date with their favourite designers. The current culture is evolving and growing faster than ever, but the 20-year cycle seems to be sustaining some truth. The things we loved in the 70’s came back in the 90s and re-imagined their way into current fashion, with its own modern twist. How exciting! Mainstream Australian fashion was heavily influenced by sports clothing and sportswear throughout the 1990’s. 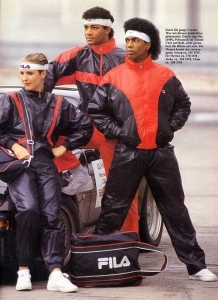 The comfortable, fleece-like tracksuits became everyday wear, beginning the rise of highly fashionable sportswear brands, such as Nike and Adidas. The sportswear trend was also stimulated by the influence of American rap and hip-hop artists, donning back-to-front baseball caps and basketball jerseys. Twenty years on, the revival of ‘Activewear’ has allowed gym-goers and super relaxed adults to hit the streets in their comfortable sportswear once again. The modern approach to athletic apparel is chic and investment-worthy. High Fashion designers like Chanel and Christian Dior are putting sneakers on the runway, along with leggings and yoga pants. Not to mention Lacoste’s Fall/Winter 2015-16 range receiving inspiration from late 60’s, retro ski and sportswear. They never really went away, but the specific 90’s style of denim jacket is back in both men’s and women’s wear. From short cropped variations to grunge styled details, the fashion industry is taking cues from classic 90’s icons and re-imagining them into modern fashion. After copiously appearing on the 2015 runway, the denim jacket has returned as the stylish man’s wardrobe essential. Made famous by the likes of every other 90’s rock band, the denim jacket has been celebrated for its high versatility. The cropped denim jacket we see today is a little more ‘boxy’, compared to the previous fit-and-flare shape and is recognised by today’s modern surf culture. Oversized denim jackets remind us of that grunge look we all loved so dearly. From Miley Cyrus to Selena Gomez, we are seeing the oversized denim reappear as a sleek and fashionable look. The early 90’s grunge phenomena took over the fashion world, allowing the wearer to express their individuality, by combining an eclectic mix of styles. The rise of alternative grunge fashion was one of the most significant trends of the decade and has punked its way into the fashion industry today. Fashion items including the ‘choker’, Doc Marten boots and ripped T-shirts and jeans. Not to mention oversized Jackets and long hair. This movement was interrupted by ‘rave culture’, where looking rich was cool again. Grunge has forced its way back into modern society, with high-end designers making their own statements about the world of fashion. 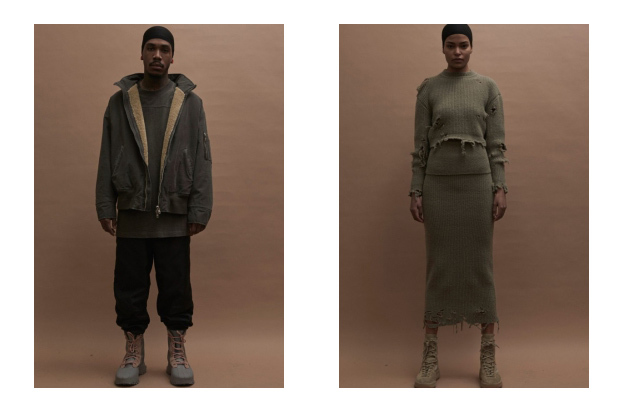 Kanye West’s ‘Yeezy Season 3’ is most notably and controversially a modern interpretation of the 1990’s grunge style. Distressed, oversized and muted tones describe West’s imaginative use of fabrics, styling and colour. The most memorable and distinctive styles have been inspired by the past, not copied from it. With the influence of the digital revolution, and the rapid increase in current culture, it is exciting to image the future of the fashion industry. With those things we loved in the past coming back in the present, we can’t wait to see what is in store for the future.